I thought about breaking in. My last run of 2008. So far we have four participants in the HM challenge. Eileen, the Running Knitter here in Arizona. She's running the PF Chang's Half Marathon, as am I.
Roobabs in Utah is running the Painters Half Marathon in St. George UT. Viv in Texas was going to participate, but she's on the DL. Viv, if you want to particpate you can pick last. Anyone that still wants to enter, just click on the link to read the rules. Book #7: 50 Things We Love About Japan. My dear mother in law gave me a stocking stuffer. It was before she knew about my quest to read 48 books before I turn 48. I'm counting it. It took me about 30 minutes to read. My wife gave me a book too. "Exploration Experience", a National Geographic work. It's huge. 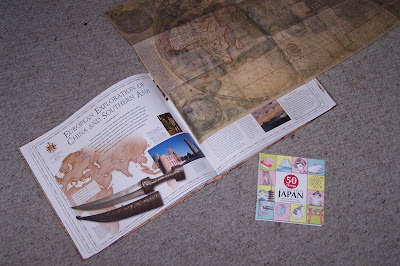 It has reproductions of famous maps and documents. I could take a college course and learn less. I'll count it. What's fair is fair. at Papago Park in Phoenix. I'm hoping to do a sub 30 minute race. If I wake up in time. And that's what I kept reminding myself as my sore legs and hips bothered me on tonights 5.35 mile run. "I don't mind if it hurts." I did take a potty break at the 2.3 mile mark. That's why you see my speedy self take off on the graph. 34.37 miles in the past 7 days. 91 miles so far in December, it's the #1 month this year. So do you think I can get to 100? *Props to Reid for looking up the answer. Mid Sixties, that's what I call great weather. I got in a nice 5 miler to the lake and back right before dinner. At a nice pace of 10:18. I've run six of the last seven days and I've run 35 miles. I'm hoping the bump up in mileage will give me a little bit more stamina for PF Chang's Half Marathon next month. The Legs Feed the Wolf - is a quote from Herb Brooks. He was the head coach of the US Gold Medal Olympic team in 1980. Watch the movie, Miracle on Ice. It's awesome, I watch it every time it's on TV. He was trying to build stamina among his hockey players so that they could keep up with the Russians. He was implying that the wolf needs to have stronger legs than his prey if he plans to eat and that his players needed to have stronger legs than the Russians if they wanted to win. Here's another quote - "The trick, William Potter, is not minding that it hurts." It's not from "Harry Potter" or even "It's a Wonderful Life". Can you guess what movie it's from? Yeah, I did the mile. I was breathing heavy from the get go. I didn't want to risk injury, so I just did an easy mile at a 10:19 pace. I thought about pushing it and running about a 9 minute mile, but I came to my senses and just did the mileage. Pat: Hey, I'm going to go run a mile and then get rid of that bush in the front yard. Pat(impressed that my dear wife thinks that a mile is 'only a mile'): Yeah, I need it to get to 30 miles for the week. Amy: That won't take you long? Pat (impressed that she thinks it won't take long): How long do you think it'll take me? Pat (crushed): You walk a mile in 20, don't you think I can run one faster than 15 minutes? Pat: I'm shootin' for 9. I'm not telling her it took me 10:19. Book # 7: Wisdom of Our Fathers by Tim Russert. It's a book you can read and put down. A collection of letters about fathers. Fittingly, it was given to me by a super dad - my father. The title is my new favorite quote. Do you know who said it and what it means? 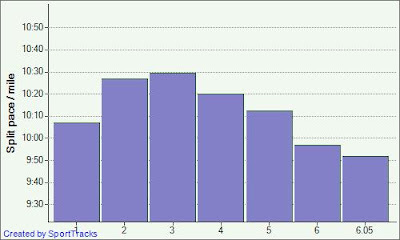 This week I ran 6, 7, 4 and 12 mile runs. 29 miles in one week is the highest since I ran the marathon in the second week of January (32.7). Yesterday, I wanted to get more miles in. But, the week caught up to me around mile 10. My plan was to do my new 8 mile loop. Take a quick refueling break at home and then do the loop again. After the second loop I planned to do 1 mile loops near home for as long as I could. I figured I could do the 16 and maybe up to 4 additional miles. I figured wrong. The second loop I cut in half and was glad to get back home. My exact numbers were 11.78 miles in 2:21:38 or a 12:02 pace. Not bad time for a training run, but I really did want more mileage. Legs felt a little tired. Lungs felt fine. But, my dogs were barking pretty bad. Which has nothing to do with the title of this post. So, what would you do? 29 miles with 9 hours left in the week. I planned on this being a rest day with a 7 miler tomorrow. Should I run ONE mile to get to 30? Or 3.8 miles for a PR in weekly mileage? It's amazing what you can do with your Garmin 305. This is a run from last year. Remember I asked, if you ran 1 mile on January 1 and double it each day, how many miles would you run in the month? It's a take off on the doubling the penny question. Chad was the only industrious one to attempt to answer. Wikianswers gives one answer, but you can find a dozen different answers online. So, Chad was the closest and I'll take his answer for being correct. click on the title and scroll way down to the bottom. It's the new D-chip with the cover stripped off. WMD got it right first. The ball in the background, is indeed rubber bands. I add a rubber band everytime I run. Javamom remembered from a long ago post and got it right first. Many of the rest of you got it right as well. Thanks for guessing. Although, I do like that shoelace ideal. Now, go visit WMD and Javamom and let them know how wise they are. I was running minding my own business when I saw the largest rabbit ever. I had to snap a photo of me holding it's ear. It wasn't moving so I got a better picture. But, that's not what attacked me. Further down the road on my 7 mile run I was dived at three times by this Bi-plane. It was yellow and red and might have had the Arizona flag on it's wings. I sometimes run past Stellar Airpark, a small airstrip with homes on the runway. Garages act as hangars. It's a cool community. This plane was practicing approaches and I'm slow enough that he flew over me three times circling to the runway. I, also ran in Gila (Hila) Springs named after the Gila Monster. I got to see lots of birds, but no monster. I even got to chase some of them. Maybe I was the monster. I ran down this canal. Not all the canals are pretty. And past this mansion on the not so pretty canal. Now, you know I'm a REALTOR, so if you are in the market, I'd love to sell you this home. Well, it's Christmas Eve, so it's time to have dinner and then go to church. Here's hoping everyone has a Merry Christmas, Happy Hanukkah, Krazy Kwanzaa and a Happy New Year! Today I had six miles scheduled. I looked at Google Earth to see where I could run. The canals? No, I didn't feel like a canal run. Desert Breeze Lake? No, I wanted something different. South Mountain's trails. No, too far away. I ended up running around my block. A one mile course that I did 6 times. Past my neighbor cleaning the street gutter six times. Past the kids playing hockey six times (rollerblades, no ice), past the park six times. But, I got into sort of a rthym and I ran the second half faster than the first. And I ran the last 3 miles progressively faster. The last mile at a 9:56 pace. None higher than 10:29. Since I ran past my house six times, I left my water bottle on the hood of my SUV and stopped there after miles 2,3 and 5. Other than that I pretty much ran straight through. It was about 4 pm and 60 degrees with clear skies. Great running weather. I ran the first 3 miles with a sweatshirt. The last 3 in a singlet. I do appreciate the Arizona weather and wish I could send some your way. So, the question of the day is - Do you like running one long run or to run laps around a shorter distance and see the same things over and over? And does it effect your running effort? Weird Fact: I haven't needed any Bodyglide in over a month. I used to use it for chafing on my legs. 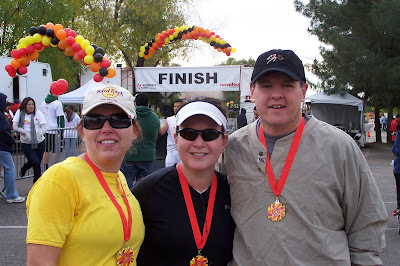 I ran the Fiesta Bowl Half Marathon without any. I'm hoping this trend will continue. Camera Question: A few of you asked how I take my pictures. I have a kodak camera I use for before and after run/races pictures I keep in my car. During the race I carry my Verizon Palm Treo that has a camera. It's great for a quick shot, but lately I've hated stopping for photo ops. 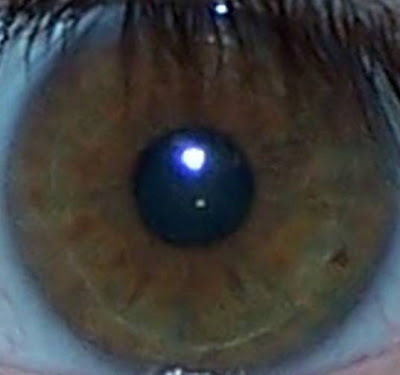 I saw an awesome picture of an eye. I tried to duplicate it with mine, but my camera just isn't good enough. The city of Gilbert, AZ is building some nice benches and a gateway for the canal right in downtown Gilbert. But, the nicest thing about the canal is just to the north -a Dairy Queen. Not sure what this is supposed to represent. It's still under construction. Maybe there'll be water coming out of the pipes. Today, I waited until it warmed up to get in a six mile run. The first mile heading east on the canal is not very pretty. It's not an active canal with running water. The weeds are high, so I'm thinking it hasn't seen any water, except for rain. The second mile is along Freestone Park. It's an equestrian trail that is easy on the legs. Scenic, since you can see the grassy hills, minature train, lakes and softball fields. Not sure why I didn't take a picture of the park. But, I did get pictures of goats and cows. Then mile 3 is part concrete paths thru the neighborhood and dirt path thru the horse properties. I ran to Greenfield Road. But, it was time to turn around. On the other side of Greenfield Road is the Gilbert Library and Raparian Water Park. The RWP has lots of trails meandering inbetween lakes and supposedly lots of birds to watch. I'll safe that for another day. This week has been great. I've gotten to run the Gilbert Canal, Dreamy Draw and the path along the 202 in Chandler. They both have to do with running, but aren't really related. Right in the middle of Phoenix is the Phoenix Mountain Preserve and Dreamy Draw Recreation Area. My appointment to show homes today was nearby, so I did a 'Superman'. Yeah, I wore my running shorts and a singlet under my clothes so that I could do a quick run afterwards. The parking lot was almost at the halfway point. I ran south for half a mile and then ran the north portion of the trail. I was suprised to see that the trail was concrete or asphalt, so I didn't need to run on the rocks that you find on Arizona trails. 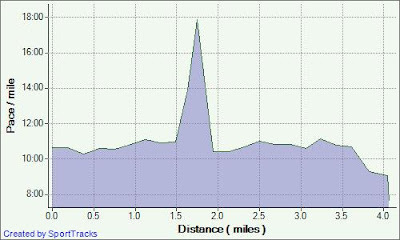 And I got to run on hills. Nothing real dramatic, but much more than the usual speed bump I encounter. This is an uphill. Hard to tell, you'll have to trust me. I did a little over 4 miles in 45 minutes. I stopped for pictures and just enjoyed the run. The path runs parallel with the Piestawa Peak Freeway and at one point I came upon a walking bridge over the road. But, most of the trail was on the other side of the sound barrier. Loud freeway on one side, quiet desert on my side. So, why is it called 'Dreamy'. Well, this is where they would mine for Cinnebar or mercury sulfide. Mercury made the miners spaced out 'like they were on drugs' or dreamy. After this great run in the middle of the day, this close to Christmas I felt a little dreamy too. Do you ever feel like the roads are always hilly? I ran 4.07 miles tonight. No, the roads were level. I just needed a caption for the picture above. As you can see by my half mile splits below I started below 10 mpm splits but couldn't hold it. At the end I decided to see if I could run the last half mile in the 8's. And I did. Double It? If you ran 1 mile on January 1 and double it each day, how many miles would you run in the month? I think I like Zazoosh the best of all the camera companies. They get the pictures up alot quicker and they always seem to do me good. Well, as good as I can possibly be photographed. These two pics are from the Fiesta Bowl half. Only 3 days to get them posted. The only downside was no finish pic. I guess that photog had to leave early. The first picture shows me with Karen in the background. And Christina's arm in yellow. I saw Jerry taking this picture. It was later in the race. You can see I've shed my sweatshirt and I lengthened my stride to make it look like I wasn't exhausted or anything. I had an appointment near a path that I wanted to run for some time now. So, I showed a home in my sweats and headed to the path right after. It was around 10 am and the rain had stopped. Matter of fact, it felt great. Maybe 60+ degrees. I ran a path that was along the freeway in Gilbert. It had a sound barrier wall and I didn't hear any traffic. Just a slow run, my first since the half. I think I had a pace around 11:20 or so. Don't forget my January Contest. If you are running a half or full marathon and would like to compete with other runners running their races around the world, this is the contest for you. Just click on the title for the details. It's my favorite half marathon, period. Today, I ran the the Fiesta Bowl Half Marathon in Scottsdale for the second year in a row. Most other races, I might have stayed in bed. The weather forecast was for rain. My heel didn't feel 100% or even 80%. But, this was the Fiesta Bowl. Bigger than Texas v. Ohio State. It's my final race for 2008. 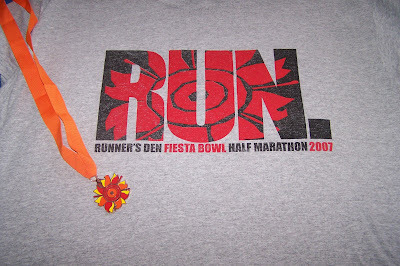 It was my final race for 2007 (funny, in 2006 my final race was the Holiday Bowl 5k in San Diego). 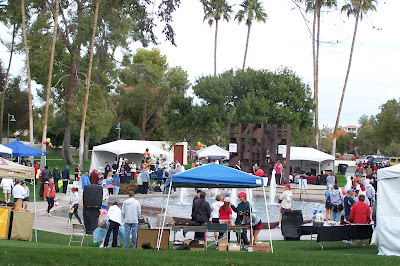 The start and finish line are at the Scottsdale Center for Performing Arts and they have a wonderful sculpture garden. I got a "LOVE" shot after the race. The finish line festival is around one of the fountains. Here's a shot right after I finished the race. The race started at 7:30 am under clear skies. I didn't feel a drop of rain the entire day. It was cool, maybe 50 degrees at the most. I started with one of my famous 'goodwill throw away' sweatshirts and got to run with Karen and Christina for a bit. I, also, got to see Chad who was running the 5k. We started 2 minutes after the gun (not that we heard it). Karen said I could go on, as I was hoping to get a PR (I always do), so after running a bit with the TRC (Tumbleweed Running Club) I looked at my garmin and headed south of an 11 mpm pace. According to garmin, the Fiesta Bowl course is 94% flat. The other 6% are speed bumps (well, the hills were not an issue). 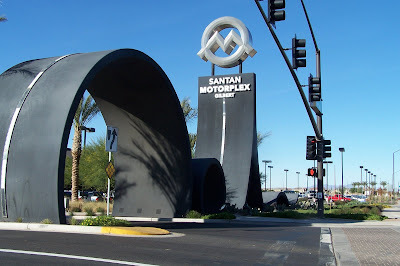 Five miles up Scottsdale rd, across Gainey Ranch (a nice subdivision) and then back home along the Indian Bend Wash (home of the SF Giants, at least in March). I love to look around as I run in new areas, so much to see. I've driven these roads, but you miss a lot at faster speeds. Six of the first seven miles were at 11 mpm or less. Mile 7 was at 9:57. I have no ideal why. My feet felt fine and I wasn't having any issues with getting winded or tired legs. I was taking some walk breaks and conserving my energy. I knew I hadn't logged enough training miles (better to spare the heel, then train too much). But the last six miles were a bit slower. Not to bore you with the details, but my left heel started to be a constant pain and I didn't deal with overcoming it like I should. I would run some, then walk some and watch all the people I pass, pass me by. I ended up finishing the race around 2:32:44, five minutes slower than my PR. I'm ok with that time. It could have been much worse. I didn't stop at the McDonalds for a Big Mac around mile 10 and I didn't stop at the Circle K for a bag of fried pork rinds at my 12 (I don't really like them anyway). I made my way to the finish, just like Karen in the picture below. Karen, got a PR and was happy. She didn't have any leg issues and you couldn't tell she had just finished 13.1 miles. She did great. Christina ran her first half marathon, therefore she too got a PR. Two out of three TRC runners got PR's today, which ain't bad (ain't ain't a word, so don't use ain't). Here's the TRC - Christina, Karen, Pat. The medals this year are the same as last year, but bigger and thicker. Metal must be cheaper this year. 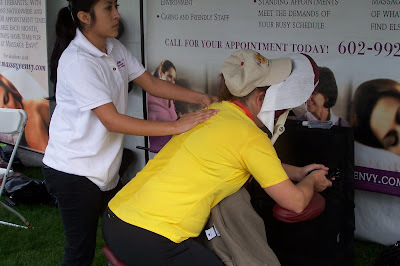 Christina getting a back rub by the fine folks at Massage Envy. If it looks painful, it probably is. But, I'm sure it was good for me. Here's Amber removing my bothersome left leg. It's actually, one of the better photos of me. I would have posted sooner, but as soon as I got home and showered, it was off to show homes and write an offer on one in Discovery at Daybreak, a townhome community in Mesa, AZ that is quite nice (can you say run on sentence) with both one and two story units that are right next to the canal, which is great for running (you can stop reading whenever you like), hiking and biking to Freestone Park or even to Tumbleweed Park down in Chandler, the home of the Tumbleweed Running Club (are you still reading?) and . . .
Last night I got in a 10k to make sure my heel could survive a longer run. I was able to do it at a 11:10 pace, so I think I should be fine tomorrow morning, as I toe the line up in Scottsdale. Last year I did this race in 2:27:41, a pace of 11:17. My Personal Record. I then added 4 miles on to my total run to get ready for the marathon I had scheduled. No bonus miles tomorrow. I hope to be under an 11 mpm pace for the entire race. That would give me a 2:24 finish and a new PR. houses. Yep, it was a long run. I then walked the rest of the way for a whopping 1/2 mile. Yesterday I ran my 1700th mile. I've gone from my son walking next to me as I was running (yes, I was that slow) to doing a 5k in 28:49. Tonight I added 2.5 miles onto my total as I did a lower body workout at the gym. I've worked out on the gym machines multiple times. Last night, while I watched 'The Biggest Loser' I used some 14 lb dumbbells and did some basic lifts. How come, my arms are more sore after the dumbbell free weights, then when I use the machines? The race, not the football bowl game. 2. I love the t shirt from last year. 3. It's my final race of the year. My Christmas gift to myself. Here's hoping everyone can give themselves a gift like this. only because there is ugliness. All can know good as good only because there is evil." How many can you name? I use the Runner's World January 2009 magazine, that I just got in the mail. Viv, down in Texas asked for some motivation. So here's some Arizona style. A Race within a race contest, right here on Pat's Blog. If you are running in a marathon or half marathon in the month of January you can take part in our race. This way Houston Marathoner's can compete with Disney Marathoner's. There'll be two categories. One for 26.2 miles and one for 13.1. 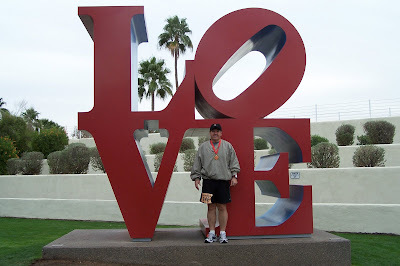 I'm doing the PF Chang's Rock and Roll Half Marathon right here in Phoenix on January 18th. Enter before january 1 by emailing or commenting on my blog. Specifiy which race you are doing, when and what distance. At the Expo, buy something under $5. If you get something for free at the expo, make sure it's really cool. After the race I will link your race report and let everyone know what you bought. Chip times at the race website will count as your official time. Therefore, I will need your real name for this contest. The fastest runner will get to pick first from our collection of goodies. Everyone wins something. You will be responsible for mailing your gift to the person who selected it. Marathoners pick from the marathon stash. Half marathoners pick from the HM stash. These rules can change. Like if someone buys an IPOD, then I'll change the rules, so that I'm the winner of said item. My broker (real estate) like to motivate us. Usually, I say 'whatever' and hit delete. I thought this was cute and very helpful. How can you run across the London Bridge, but never leave the country? By running the Havasu Half. Way back when, the founder of a chain saw company bought the London Bridge. Took it apart and reassembled it in Lake Havasu, AZ. It was rebuilt on dry land. They then dug a channel for the Colorado River under the bridge, making an island and a tourist trap. Anyway, that's one of the races I want to do for 2009. It's the Ceiling of The Lone Butte Casino. 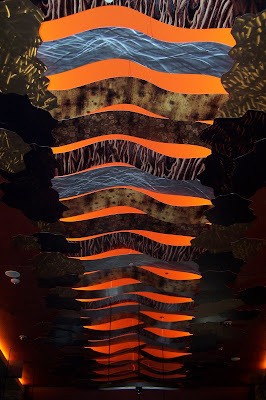 The picture from yesterdays post is some artwork on the ceiling of our newest casino. I went over to take some pictures. The casino took $4 from me. It was the biggest gambling loss of the year for me. No time to run today, as we celebrated the season by putting up the Christmas tree and decorating the house. Hope all of you are enjoying this joyous time of year. A run in two parts. I went over to Desert Breeze Lake to get in a nice 4 miler. I guess I didn't have enough gas in my tank because I just felt really tired all the sudden. Can you guess from the graph below, where that happened. I made it back to my car. Drove home. Ate a home made brownie with chocolate sauce on top and then went out and finished the 4 miler in my neighborhood. I ran at a 10:50 pace and got below 9 mpm at the end. Felt great and my foot feels fine too. 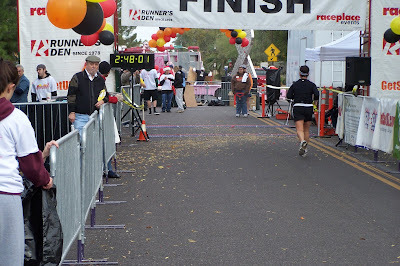 Hopefully, I'm turning the corner and can still run next Sunday in the Fiesta Bowl Half Marathon. Can you guess what this picture is about? Have you read the book or seen the movie? The Secret? It's about "The Law of Attraction". Yesterday I read the first couple chapters while I was waiting for a client. It over simplifies the ability that if you think positive and make wanting something a priority then you will attract it. Think of a million bucks and it's yours. Think that you'd love for the nuisance at work to be gone and she gets transferred. Think that you'd like to qualify for Boston and you got it. So, I immediately thought that I'd love to run without that pain in my heel. My client showed up and I went to work. Later in the day, I got my issue of Runner's World Magazine. I read it and found on page 115 an ad for Triggerpoint, a seller of self messaging tools. It shows an arrow with 'symptom' pointing at a runner's heel. Then it shows an arrow with 'problem' and it's pointing at the runner's lower leg. Aha. I attracted this ad into my life. I checked out the website and immediately got my 'Stick' and started working on my lower leg. And my foot feels better. Now, I do believe in thinking positive and that you can attract what you want into your life if you work towards a goal. I just think it's more complicated than what the authors indicate in the first few chapters. Maybe I'll read further into the book. I got in 2.5 miles on the treadmill with little discomfort in the heel. I then lifted weights, upper body for about 45 minutes at the Tumbleweed Rec Center. Not sure if I trust the treadmill mileage. I was going at a 12 minute pace, but it felt faster. Isn't it just recording the mileage of the belt and if I were to stand on the side rails it would still be recording mileage? Overall, it was a good workout and maybe I've turned the corner with my foot. Now I can start applying the 'Law of Attraction' to getting a million bucks! Running from Sea to Shining Sea! Nikemom has this cool ideal to run from the Atlantic Ocean to the Pacific with all her friends. Since, we all can't take the time off work, we're going to do it VIRTUALLY! And you can join in the fun. Starting January 1 we will be leaving from somewhere on the east coast, maybe Nova Scotia. Is it cold there this time of year? Running down into Maine and maybe a visit to LL Bean and then onto Boston. We must stop at Heartbreak Hill. Then south, where it's warmer. I really want to go over the Verazzano Bridge and do a loop around Central Park. How about running down the mall in DC and up a country road in the Blue Ridge Mountains. Well, you get the point. This is going to be quite scenic and a great way to keep motivated while you are running back home. I plan to be the leader when we reach Arizona. A virtual run down the Grand Canyon and maybe a water stop on Arizona's most famous corner (don't google it, you'll just spoil the surprise). Can you guess which one? Come join us as we run around America. today's workout: Upper body and lower body weights. 34 minutes on the exercise bike while I watched the Suns get pounded. Did you google it? Don't tell anyone else. Last nite I spent 65 minutes on the exercise bike while I watched the Biggest Loser. It was the makeover show (not my favorite episode) and they all looked good except for Vicky. The dyed her hair red, but they should have done it black and white like Cruella deVil. Vicky is just a mean nasty lady. I'm hoping it's just acting for TV or choice editing by the producer, because no one should be that mean in real life. Thanks for all the insight. I do appreciate all your comments. I've had Plantar Fascitis before and it's always worse first thing in the morning. I can barely put my foot down on the floor or walkto the bathroom. Steps are a killer. By mid afternoon it's gone, but the next morning it's just as painful. It's inactivity that makes PF hurt. I believe the tendor or plantar gets tight and thus hurts. This is not that. I think it's either a stress fracture or tendonitis. First thing in the morning my heel feels great. I can walk to the bathroom with no problem. But, when I start to walk or run, then it hurts. I can run a race and put up with the minor pain, but afterward it really hurts. Right now my heel just feels achy and tired and that's from walking around showing houses. Let's hope it's tendonitis and rest, ice and some ibuprofen is the winning combination. The final option is that Vicky (Biggest Loser) has a voodoo doll of me and is pricking the heel with a pin. She's mean enough to do that, you know. The Gym and The foot. After my PR run on Thanksgiving morning I didn't run again until last night. 3 and a half days off. I could still feel pain in my left heel. Not the whole heel. I can push my finger on one spot and feel the pain. It feels like it's in the meat, not the bone. So, off I went to the Tumbleweed Rec Center. I immediately tested it on the treadmill. Did a mile in just over 10 minutes. It hurt some. Not enough to were I had to stop, but enough that I wondered if I was keeping it from getting better. It's been 16 days since I've run outside, not counting the two races I ran in and it's only gotten moderately better. I continued to do my "Run for Life" weight routine. First Upper body, then the lower body. I pushed myself a little bit harder this time and was happy with the workout. Then, back to the treadmill for another mile, I thought. I could feel my heel alot more this time and I stopped within the first minute. Here's hoping I see some improvement on the heel this week. Has anyone had any issues like this? Is it tondenitis? Is it a stress fracture? 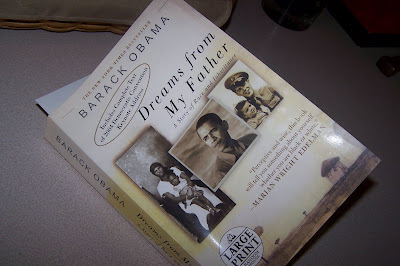 "Dreams from My Father" by President Elect Barack Obama is an amazing autobiography of Obama's earlier years. Not his political years, but up to his time entering law school and his wedding. It doesn't matter if you are a democrat, independent or republican, this book makes you feel like you know Obama as a friend would. I highly recommend it for any american. For anyone in the world, for that matter. My son, Tyler bought it for me as a birthday present and bought the large print edition. It was actually easier to read for this old man and so I might buy other books in large print. *I should note that Obama wasn't talking about not caring about an injury that could become worse and limit one's physical ability. This was in reference to enduring pain so that you can accomplish greater things. I'm sure our President Elect would want me to take care of my heel. Or am I just being a wimp?